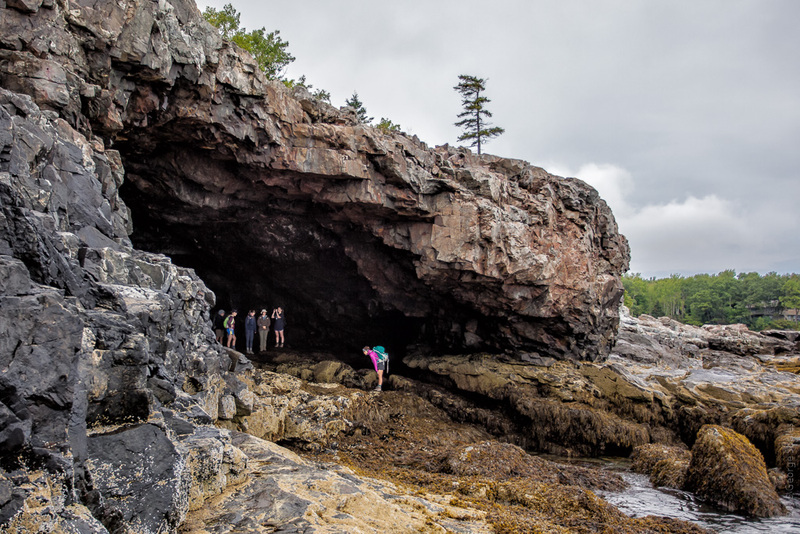 I have heard about and seen images of the Anemone Cave ever since I first came to Acadia National Park in 1977, but I had never seen it. In fact, I never even knew where it was until recently. There's a good reason for that. Access to the cave is difficult and dangerous and the environment is fragile. To protect it, the park service has removed it from maps and basically keeps it a secret. So I'm not going to tell you where it is or how to get inside, but if you are incredibly curious, then I suggest that you read about it on my friend Jenn Booher's Coast Walk post that describes it. 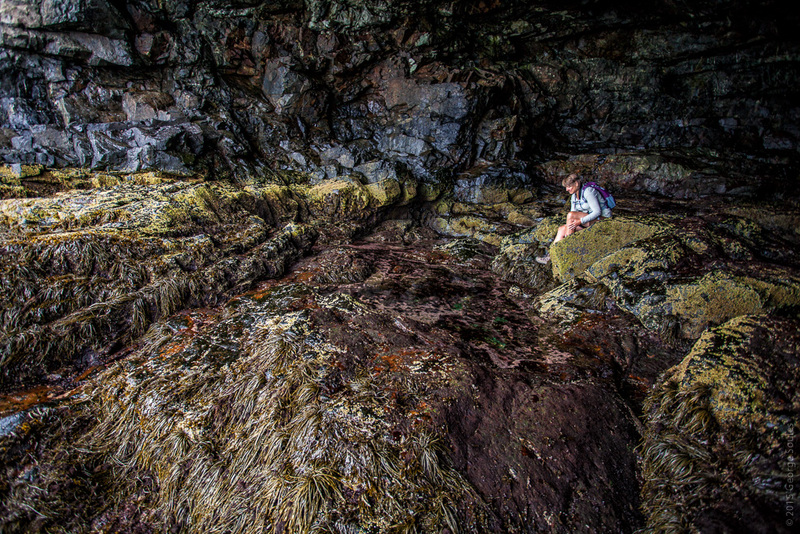 Not because I want to help you find the cave, but because I want to turn you on to Jenn's incredible adventure walking the entire shoreline of Mount Desert Island. Not to mention that Jenn is a lovely women and talented photographer who creates the most fantastic and beautiful images from objects she finds while beachcombing. So you know, I risked my life getting the three shots below. The group inside the cave are students from Colby College who were kind enough to unknowingly provide me with just what I had hoped for, a picture of the mouth of the cave with "rusticators" inside to provide a sense of scale. The other photo is of my wife Janice enjoying a tide pool within. I shot these images with a Canon 5D2 and a 17-40mm f/4 lens at 17mm. 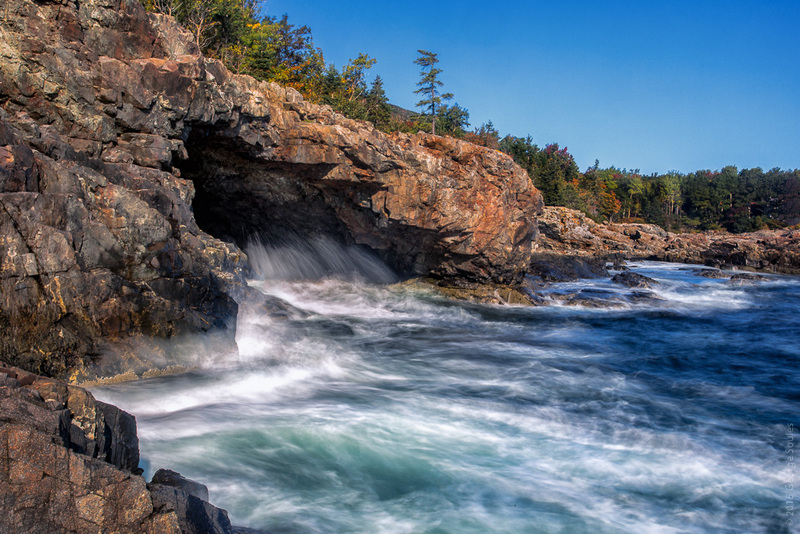 The 5D2 is my backup camera, which I would be loath to lose, but it's the one I take on dangerous trips like this or while hiking the icy peaks of Acadia in winter. 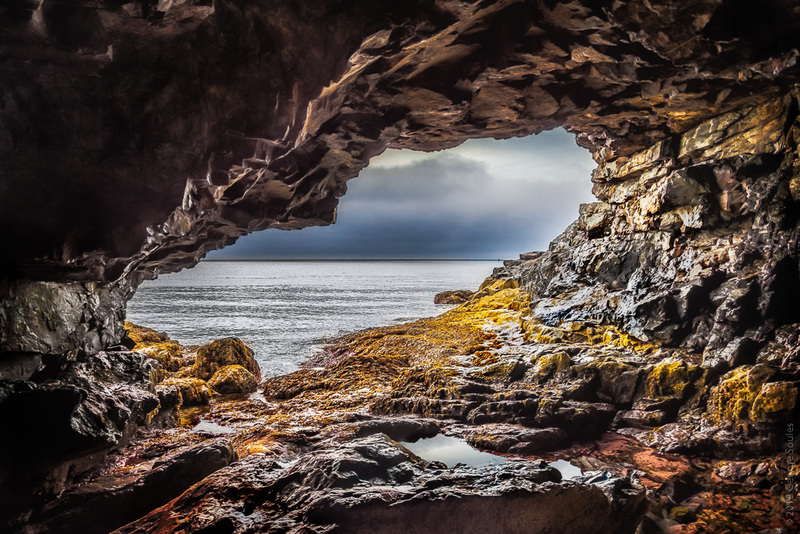 The large photo below from the inside of the cave is necessarily an HDR image made from a half dozen exposures that capture the extreme dynamic range of the scene (from pitch black inside to very bright outdoors). To make the exposures I used a monopod which doubled as a walking stick during the trek in and out. If you do choose to visit the cave, please be very careful and tread lightly. UPDATE - I went back to the cave on October 8, 2015 and took the last image below at high tide. To slow down the water, I added a 3-stop neutral density filter plus a polarizing filter and then shot at f/22 for 1.3 seconds. I used the same 17-40mm lens as before, but at 33mm and with the camera mounted solidly on a tripod. Later in Photoshop I combined the white water from two different images to get the effect I wanted.